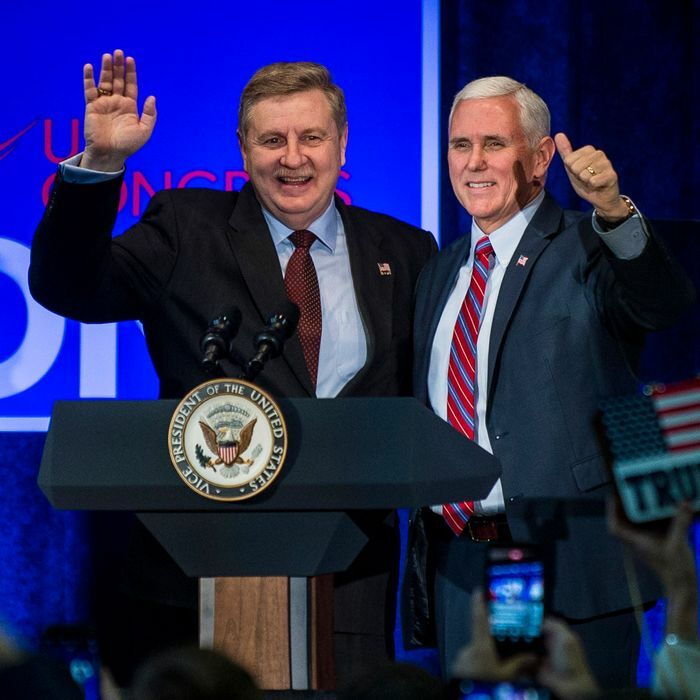 Mike Pence makes it clear GOP special election candidate Rick Saccone is his and the president’s man. The big regular off-year elections in New Jersey and Virginia were Democratic routs by any measure, and produced new excuses for failure: Trump blamed Virginia GOP gubernatorial candidate Ed Gillespie for not running a cookie-cutter campaign based on his own, and Republicans could blame the New Jersey debacle on Chris Christie’s profound unpopularity. Now, though, a special election is approaching on March 13 in Pennsylvania that will leave no excuses for Trump or for Republicans if the GOP loses. The district itself is both strongly Republican (its Cook Political Report PVI is R+11, which means it has recently voted more Republican in presidential elections than the nation as a whole by 11 percent) and unlike, say, Georgia’s Sixth Congressional District (that district’s PVI is R+8, but Trump only won it by one point), strongly pro-Trump as well (the president carried it by 20 points). Raising the profile of this race still more as a potential 2018 bellwether is that the Democratic candidate, former local prosecutor Conor Lamb, is regularly described as being “straight out of central casting” — a 33-year-old Marine veteran with deep roots in the district and a moderate issues profile and style. Unsurprisingly, reports Politico, the national GOP and the Trump administration are taking no chances in this race. Trump himself and Vice-President Mike Pence have already appeared in the district with Saccone, and are prepared to do so again, with Cabinet members also on call to take the short trip up to Pittsburgh. Saccone is not a particularly good fundraiser, so the GOP and outside groups are already making up for that abundantly; at the moment, “Republicans [are] outspending Democrats on TV by nearly 5-1,” with more money on the way. All this national and conservative-movement activity is occurring at a time when their huge built-in advantages in the district are potentially being strengthened by an abatement — perhaps temporary, perhaps not — in the intensity of the Democratic “wave” that was so evident at the end of 2017. The Democratic advantage in the congressional generic ballot — a regular measurement of national party strength in a midterm election — has by most accounts shrunk by more than half since its peak just before Christmas. There’s more than a month to go before voters in Pennsylvania’s 18th District go to the polls, and a lot could happen in the interim. But it’s pretty clear this is not only the GOP’s race to lose, but one that if they do lose could indicate a real disaster in the making for Trump and his party.